These heirloom-quality tools are made from hand-forged steel and finished with black walnut handles. If only our ancestors millions of years ago had a set of history student-turned-blacksmith Tuli Fisher's tools (and fire). 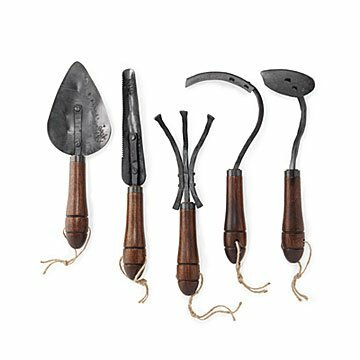 Using traditional blacksmithing techniques in his Montana workshop, Tuli hand-forges steel to create the five pieces in this heirloom-quality gardening set, finishing each one with a smooth black walnut handle. Durable with a decorative touch, the tools are made to last with materials from the USA and come in a burlap pouch for rustic portability and storage. Handmade in Bozeman, Montana. With degrees in Museum Studies and History, it’s no wonder Tuli Fisher has made a business from objects created millions of years ago. Soon after the blacksmith began hand-forging garden tools and studying traditional tool making, Tuli began working with a farmer who trudged through an early spring snow for help repairing some tools. After fixing them, and making even better ones, Tuli discovered a new passion for his blacksmithing skills, and a collection of gardening tools followed. Tuli lives in Bozeman, Montana with his wife and two Australian Shepherds. Although he occasionally pines for the deep red tomatoes grown in warmer climates, he, like any northern gardener, has learned to appreciate root vegetables, brassicas, and many other cold-tolerant plants. Clean tools off with a brush and soapy water. Oil occasionally with linseed oil. Exquisite! They are a work of art. Best gift ever!!! I gave these to a friend who is a very seasoned florist (who has owned several shops) and garden club member. In her own words "I was so impressed with these garden tools, the quality, way they contour to your hand is impeccable. They are so nice I will have to update my will to put these as a seperate item by themselves because they are truly heirloom quality". Yes, they are expensive but so worth the quality that you are getting. Wish everything was still made this well.